Alden Richards on giving up Louise delos Reyes: \"Ayaw ko na rin po ng conflicts, e.\"
Alden Richards on giving up Louise delos Reyes: "Ayaw ko na rin po ng conflicts, e."
Alden Richards says it is better to maintain good friendship rather than pursuing former Tween Academy loveteam partner Louise delos Reyes. "Magiging complications kapag pinursue ko po kung ano ’yong more than friends. So, chill na lang po kami, just working relationship kasi mas masaya po kami, e," he says. Alden Richards might have previously failed in two reality talent-search shows, but he still managed to enter show business. In fact, he is now being groomed as the next leading man by the Kapuso network. 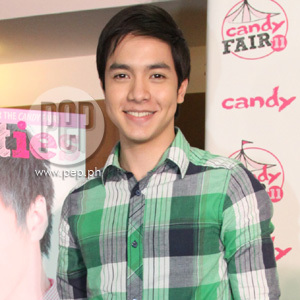 From his introductory role in the afternoon telefantasya Alakdana, Alden became part of the movie Tween Academy: Class of 2012. After this, he will next be seen in GMA Films’s suspense movie The Road. For Alden, the success he’s getting in his showbiz career is happening too fast. "Ang bilis po, e. I don’t know, parang it’s really a good blessing," said the former StarStruck hopeful said in an interview after the press conference of Candy magazine’s annual Candy Fair and Candy Cuties earlier today, September 3, at Dolcelatte Restaurant in Quezon City. He further said, "’Yong trust na nakuha ko from the network, sa mga boss ko po, sa GMA Artist Center, sa GMA Network, parang ang bait lang nila sa akin. "They really put an effort [for me] to really be their future leading man. In return, Alden said, "Ako, talagang very thankful. And they can count on me that I will do my best sa lahat ng pojects po na ibibigay sa akin." Aside from GMA-7’s StarStruck, Alden also attempted to join show business via ABS-CBN’s Pinoy Big Brother Teen Edition. DREAM LEADING LADY. Like other newbie actors, Alden also hopes to become a lead actor in a TV series. And when the media asked him who he would like to be his leading lady, Alden replied, "Puwede na po ba ilagay natin sa taas agad? Sana po Marian Rivera." He explained, "Kasi, parang big accomplishment ’yong maka-partner mo agad in your launching teleserye ’yong primetime queen, di ba? "Sana po talaga. Sana lang. "Kung hindi naman po, it’s okay. "Kasi, kung sino naman po talaga ang ibigay ng network, ’yon naman po ang masusunod. "Pero sana lang po Marian Rivera." KEEPING FRIENDSHIP WITH LOUISE. In his past interviews, Alden admitted that he had a crush on Louise delos Reyes, his onscreen partner in Alakdana and Tween Academy. It still seems to be the case until now because Alden chooses to be the "third party" if they are to star in movie together. However, he clarified that he would want to be Enzo’s rival only in a movie or a TV project. In real life, Alden said, "I won’t consider [Enzo] naman po as karibal. Kasi, trabaho lang po talaga ’yon, what I have with Louise, e."
Alden also told the media that he has already decided not to pursue Louise. He explained, "Kasi po, parang masisira ang samahan namin if I go beyond. "At the same time, magiging complications kapag pinursue ko po kung ano ’yong more than friends. "So, chill na lang po kami, just working relationship kasi mas masaya po kami, e.
He added, "Ayaw ko na rin po ng conflicts, e, mas maganda po kung smooth lang ’yong takbo. "Kung may chismis man, positive lang." Despite these statements, Alden still had a hard time answering whether or not he still has a crush on Louise. Instead, he replied, "Basta we’re good friends po. Not being too showbiz, pero magkaibigan lang po kami talaga."